The climb has been done three times in the Tour de France this century – 2000, 2002 and 2009. It is also featured regularly in the Dauphine, which is where the record ascent comes from. That belongs to Iban Mayo, who ascended the timed portion (15.65km from St Esteve) it in 45:47 during the individual time-trial of 2004. In the current era, the top 30 times are shown below, by ranking. I have indicated some noteworthy performances – the top times of 2000, 2002 and 2009 belong to Pantani & Armstrong (49:01), Armstrong (48:33) and Schleck & Contador (48:57), respectively (times courtesy vetooo on twitter , and available here). Also indicated is the predicted performance based on Scott Richard’s and Doc’s pVAM method – that corresponds to a pVAM of 1617 m/hour, a calculated power output of 5.63 W/kg (Ferrari method), and a time of 50:46. 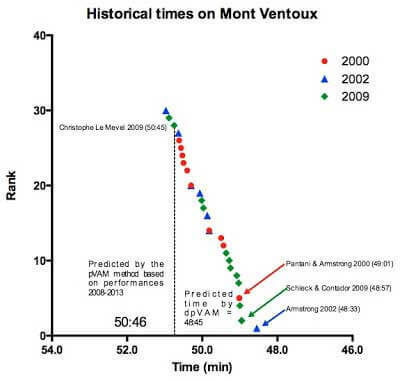 You may recall that this pVAM was produced by analyzing the performances of the top 3 in the Grand Tours since the biological passport was introduced (2008 to present), and then working out a prediction that is influenced by the length of the climb, its gradient and its altitude. The method allows different climbs to be compared against historical ‘benchmarks’, as it were, for theoretically non-doped riders (given some of the names on that list, this is of course untrue, but doping is relative). You may recall that back on Stage 8, on Ax-3-Domaines, the only two riders who were faster than pVAM were Chris Froome and Richie Porte. Froome’s ascent, much debated here and elsewhere, was faster than the dpVAM on that day as well, so it will be interesting to see how the entire peloton performs today. The record ascent of Pantani is a crazy fast performance, coming as it did during a 231 km stage (the summit was not the finish line that day). Eros Poli got himself about 20 min clear at the bottom of the climb, but held on despite Pantani’s record pursuit. The performance predicts a power output of approximately 6.4 – 6.5 W/kg, and given who it belonged to, it’s fair to say that 6.4 W/kg for 46 minutes represents a doper, at the peak of his ability, and at the peak of doping assisted performance. In the 2000s, post the EPO test, doping got more sophisticated and probably less effective, which is why the times of the 90s and early 2000s are a little faster than those from the mid-2000s (you’ll see this clearly when we look at Alp d’Huez later in the race). So, 6.4 W/kg for 46 minutes? Makes one wonder about the recent claims of 6.5 W/kg for an hour being acceptable for non-dopers, the “new rung” of normal, I believe it was called. Last week, all estimates for Chris Froome’s Ax-3-Domaines ascent ranged between 6.2 W/kg and 6.4 W/kg for 23 minutes. He’d need the same performance for twice as long to match Pantani, and an even better performance for almost three times as long to hit that ‘new rung’. I’ll give Allen the benefit of the doubt and say that something is lost in the definition and application of FTP to TDF performances. And failing that, you can always buy a power tap and use it to train smarter, as per Allen’s signature bar on his comments , and his criticism turned sales pitch .Point is, I think it’s fair to say that we won’t see this type of performance today, notwithstanding the fact that Froome doesn’t need that kind of performance at all. 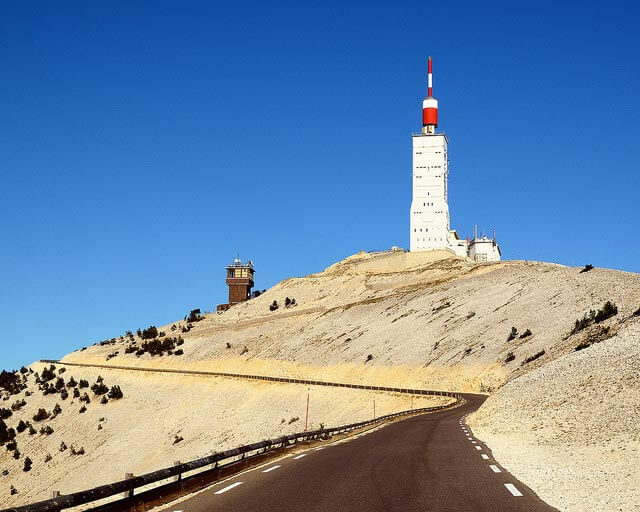 The second, and very important thought is that Mont Ventoux is a very difficult mountain to predict because of the likelihood of wind. It’s almost always windy, because it is so exposed, particularly in the second half, and so a headwind or tailwind, as I’ve explained a few times during this Tour, will affect the calculations because they’ll affect the performances. We also have only three recent ascents to work from, plus that outlier of a performance by Pantani. Alp d’Huez is a far better climb to model things like pVAM for, because the data set is so much bigger.Apparently, there is a headwind forecast for today – that would slow the times down, so that all estimates of power output would under-estimate the real performances. So let’s keep that in mind so that we can use some common sense in the discussions later, bearing mind there is some error and we don’t get to see the actual SRM values. What we can do, after the stage, is try to overlay wind maps onto the Tour map and get a better idea of what the wind would have done. I will also, I hope, get some decent finisher’s SRM values, which can be used to validate any estimations. It’s not that difficult, so before everyone has a coronary about the error, just breathe, and let’s remember to be sensible about understanding the context. The gravity component is far and away the largest. This is important for error discussions, because the error due to gravity is relatively small because it’s always constant. The calculation of the absolute power output can be affected by the assumed mass of the rider plus the bike, but the relative power output is not too badly influenced by this (it cancels out – try it and see). There’s around a 1% error in the calculated absolute power output for every 1kg “error” in mass, but the relative power output (W/kg) is only 0.3% different. All in all, as Doc points out, the error in the gravity component of power output is small. Finally, some thoughts on the day. After Froome’s small time loss in the final 30km of Friday’s windy stage, there is renewed interest in the yellow jersey race, mainly because other teams now have some more optimism about their chances. Prior to that, Froome’s dominance on Ax-3-Domaines and in the TT suggested that others would be hoping for a major change in his form.He described the time loss on Friday as a moment of carelessness (as opposed to weakness), which is feasible in those conditions. Perceived weaknesses from Sky last Sunday (not a single second rider in support of Froome in the top 30 over the final two Category 1 climbs), and on Friday, will provoke others into fancying their chances of isolating him very early on during the Ventoux climb. That will, at the very least, make for an interesting tactical battle. Those tactics and attacks (by Movistar on that occasion) split the race last Sunday, but Froome was good enough and astute enough to control the attacks that came from Movistar. A similar thing may happen today, though whether Saxo or Belkin can offer anything more than Movistar remains to be seen. I’d bet the Froome will be relatively comfortably able to respond to Mollema, Contador and Ten Dam, based on his form in the race, even without team support. In terms of our analysis of the power, last weekend in the Pyrenees suggested were were looking at two races – the peloton was going relatively slowly (much slower than the pVAM), whereas Froome was faster. Having seen the time that he can gain in the time-trials, Froome no longer needs to gain time in the mountains, and can thus afford to follow wheels, perhaps attacking for seconds closer to the top, if he wishes. As a result, the climb today will, in my opinion, be done at the pace of the peloton, and so I don’t expect that we’ll be having discussions about “super-human” or “mutant” performances. I think it will be slow, because its best rider will be conservative. However, let’s hope for a really interesting day, and proactive riding from the Spanish teams, and Belkin, with some French aggression thrown in for Bastille day. Follow me on Twitter and on Facebook for first thoughts during and after the stage, and then I’ll try to do a more comprehensive analysis here on the site by tomorrow.